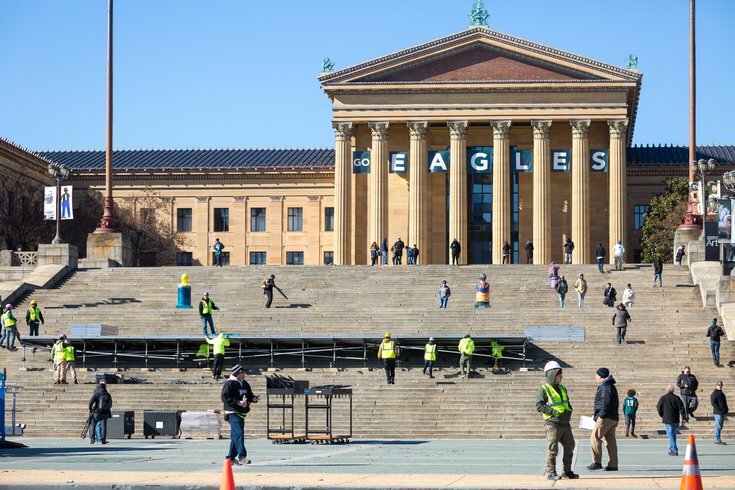 A stage is being constructed on the steps of the Philadelphia Museum of Art for the Eagles' parade that will be held this Thursday. The Eagles' Super Bowl parade could draw 2 million fans on Thursday, surpassing the sea of fans that watched the Philadelphia Phillies World Series parade 10 years ago, Mayor Jim Kenney said. Speaking at a Wednesday afternoon press conference, Kenney said the city doesn't know exactly how many fans to expect for the celebration, which includes a parade up South Broad Street and a ceremony at the steps of the Philadelphia Museum of Art. But he suspects it will be a very high number. "We know it's going to be a lot," Kenney said. "I think it was a million-plus for the Phillies. We could hit 2 (million), maybe go over that. I'm not really sure. "It's all according to how many people can get into the city. That's why public transit is so important." Kenney again advised fans to ride SEPTA into the city for the Eagles parade, which begins at 11 a.m. at Broad Street and Pattison Avenue in South Philadelphia. SEPTA is offering free rides on the Broad Street and Market-Frankford subway lines, which can transport about 65,000 people an hour. By contrast, the Regional Rail system will only be able to accommodate about 70,000 fans throughout the day. SEPTA will operate express trains from 37 stations, directly transporting fans to either Jefferson or 30th Street station. Only passengers with pre-purchased passes will be permitted to ride on Regional Rail trains. SEPTA sold out of discounted Independence passes within 24 hours. "There's a lot of Eagles fans," Kenney said. "The Eagles' fan base goes from Delaware to Central and Southern New Jersey to Reading and Allentown. There's a lot of folks that bleed green." And they have been waiting 57 years to revel in the Eagles first championship since 1960 – seven years before the Super Bowl began. City officials advised fans to dress warmly, noting the forecast calls for sunny skies and temperatures in the mid-30s. Fans should expect to walk considerable distances and wear comfortable shoes. Kenney advised them to pack snacks, because restaurants along the parade route – if they remain open – will be crowded. And he urged fans to leave the beer at home. He said the promotion by Bud Light – one free beer for all fans of drinking age – will remain inside participating bars. "We have open container laws," Kenney said. "People – if they're that obvious – it's going to be removed from them. That promotion is inside, it's not outside." Kenney insisted that he does not anticipate rowdy crowds, noting the celebrations that got out of hand on Sunday followed a several hours of drinking and occurred at night. "There will be a lot more families coming," Kenney said. "There will be a lot more grandparents coming. This is a generational celebration. I'm confident we'll be fine." Still, he chastized the Eagles fans who vandalized property on Sunday night after the team's thrilling 41-33 victory against the New England Patriots. Police have arrested several people for vandalism and are pursuing additional leads. Kenney called the vandalism witnessed Sunday night "extremely annoying and concerning," though he noted it has occurred in other cities as well. "What I don't understand is how dumb people can really be," Kenney said. "These days, everything is videotaped. And it's not only videotaped by security cameras, it's videotaped by themselves and their friends and put on social media." City officials expect crowds to begin lining the parade route early Thursday morning. Hundreds of thousands will gather along the Benjamin Franklin Parkway to watch several Eagles players give speeches in a ceremony on the steps of the Philadelphia Museum of Art. Kenney urged fans to remain patient throughout the day, saying there will be long lines everywhere. "Remember, this is supposed to be a positive event to celebrate our Super Bowl champions," Kenney said. "Please be patients with the crowds and be patient with each other."